* What is life with out a good revival?... Kurt Weill’s operetta “The Firebrand of Florence” was seemed doomed from the start when it opened on Broadway in March 1945. It closed a month later and (except for a few songs) was neglected until about 10 years ago. Vivien Schweitzer has reviewed a seemingly lively semistaged performance of the work at Alice Tully Hall. The operetta, with lyrics by Ira Gershwin, is based on Edwin Justus Mayer’s 1924 play about the 16th-century Florentine sculptor and goldsmith Benvenuto Cellini (also the subject of an opera by Berlioz). Benvenuto escapes being hanged after the Duke of Florence frees him so he can finish a previously commissioned sculpture. Benvenuto then energetically woos Angela (his favorite model, whom the Duke also has a crush on) while the Duchess of Florence chases the wily sculptor. Oh, the DRAMA! * Nothing raises $6.3 million like a good gala... As previously reported here at A Liberal's Libretto, the Met celebrated it's 125th Anniversary this weekend. The sold out celebration reportedly brought in $6.3 Million for the company, where star power and visual effects made for an entertaining evening. But, the star that seemed to shine brightest was that of tenor Placido Domingo who celebrated his 40th season since stepping in for Franco Corelli in Francesco Cilea’s “Adriana Lecouvreur” in 1968. In that time, the tenor has sung 45 roles and conducted nine operas at the Met. By the way, the stars weren't just on stage. Check this out to see a few who walked the press line. (Photo Top Right: "The Firebrand of Florence": Nathan Gunn and Anna Christy with the Collegiate Chorale at Alice Tully Hall. 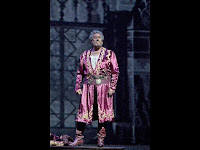 By Erin Baiano for The New York Times Middle Left: Placido Domingo as Othello - Bloomberg News.